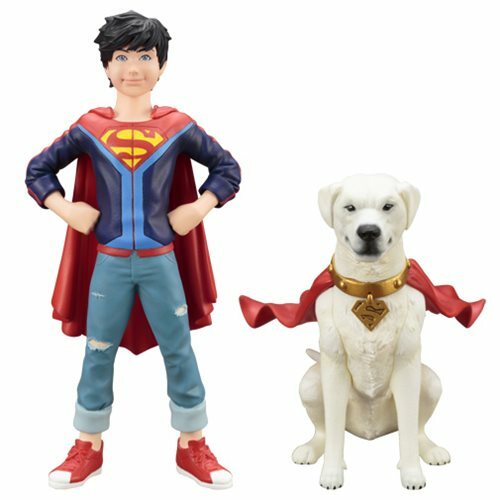 Kotobukiya's ARTFX+ series turn to the exciting Super Sons monthly comic book series starting with Jonathan Kent and Krypto! Jonathan stands about 5 3/4-inches tall with his partner, Krypto, standing slightly over 3-inches tall. Display Jonathan and Krypto by themselves or with other ArtFX+ statues (sold separately). both figures are made of plastic and come packaged in a window box. Jonathan is the biological firstborn son of pre-Flashpoint Superman and Lois Lane and is half Kryptonian/Human. He was named by his parents in honor of both of his grandfathers (Jonathan Kent and Sam Lane). Ages 14 and up.